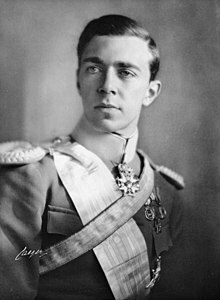 Prince Gustaf Adolf (22 April 1906 – 26 January 1947) was a Swedish prince, 2nd in line of succession to the Swedish throne after his father. Born in Stockholm, he was the eldest son of Prince Gustaf Adolf of Sweden and his first wife Princess Margaret of Connaught. Prince Gustaf Adolf was the father of the current king, Carl XVI Gustaf. This page was last changed on 24 August 2018, at 17:42.